View and search this newspaper by clicking on the Chronicling America link below. 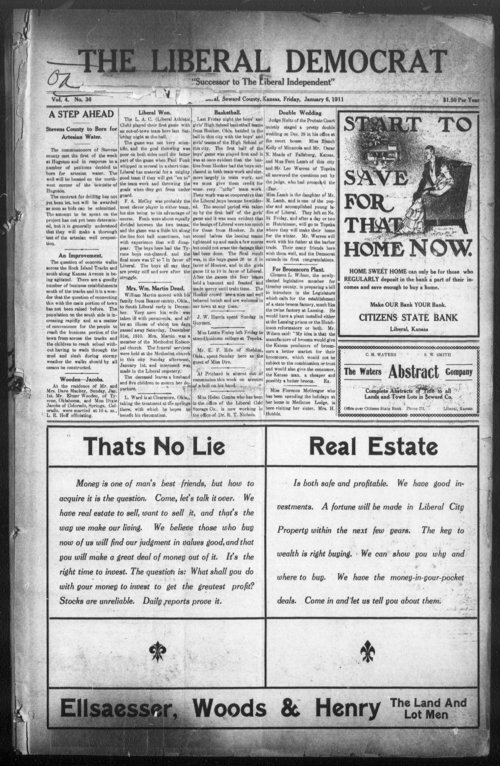 This newspaper comes from the collections of the Kansas Historical Society and was digitized with funds from the National Endowment for the Humanities as part of the National Digital Newspaper Program. "With a strong desire for a democratic newspaper" in Liberal, Kansas, Carl G. Eddy took over the Liberal Independent and it was renamed the Liberal Democrat. The newspaper followed the population boom brought by the Rock Island Railroad. It also covered local news in the communities of Enterprise, Obern, Alma, Eureka, Doby, Sunshine, Bethel, and Harwood Kansas.